Your diet reveals many things about your overall and oral health. For example, patients with diets heavy in sweets have a greater likelihood of developing diabetes and even gum disease, if their teeth cleaning regimen is sub-par. On the other hand, eating plenty of fruits and fresh veggies helps fortify your teeth and body, which makes for a much healthier individual. In the following article, Dr. Michael J. Young, your Lafayette, LA dentist shares which foods to eat to stave off oral diseases, like, gum disease. Citrus. Tangeries, mandarins, grapefruits, and oranges have more in common than just falling into the citrus fruit category together. These fruits come loaded with vitamin C, which is an essentially vitamin for the soft tissues in your mouth. With more vitamin C in your body, the gums can ward off gum disease and repair weaknesses within the tissues. Furthermore, vitamin C helps fortify your body as a whole to ensure you stay healthy year-round. Leafy greens. Do you want to increase your intake of antioxidants, vitamin E, and folic acid? Then try incorporating more leafy greens into your diet. Vegetables like, asparagus, kale, cabbage, and even turnip greens have plenty of aforementioned nutrients to support a healthy mouth and body. According to your Lafayette, LA dentist, the cells within the gums thrive in the presence of vitamin E and folic acid. With an increase of it in your diet, your smile can remain resilient against dental diseases and illnesses. Fatty fish. Doctors rave about the benefits of omega-3’s. According to a study conducted back in 2010, patients who ate more omega-3 fatty acids, significantly reduced their risk of periodontal disease. You can find omega-3’s in fish, like, cod, salmon, tuna, and even sardines. Nuts. Often described as a superfood, nuts have been considered a nutritional gold mine. Since nuts come natural filled with vitamins, minerals, fiber, protein, and omega-3’s, it’s the perfect go-to snack. Plus, those healthy qualities make nuts an excellent choice for you smile, too. 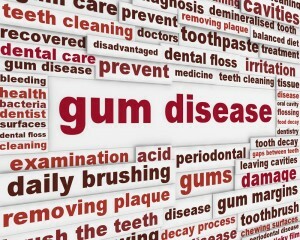 If you would like more gum disease prevention methods, ask Dr. Young for tips. With his help, you can ensure your mouth keeps its clean bill of oral health. To schedule an appointment with our Lafayette, LA dental practice, call us at (337) 237-6453. Also, visit our website for services, patient information, and to learn more about our team. We happily welcome patients from Pilette, Walroy, Long Bridge, Scott, Broadmoor, and neighboring cities.